The past four years have been the best four years of my life. BU has been my home and my family since I was 18 years old, and I can honestly say you’ll be my family for life. To every single teammate that I’ve had here, thank you for everything you’ve given this school and this program. Every day since I have been here, I have always been the happiest at the rink with all of you. Each team went through a lot of unique ups and downs, and I wouldn’t want to have gone through them with anyone else. You guys shaped every single player on this roster today and you got the program heading in the right direction. To the band and all our BU fans, thank you so much for all the support and love you give our team. You all make every single game day special and your passion drives us on the ice. You are the reason why is BU such a special place to me. Each game day you drove me to give my all to this school. To all our coaches, thank you for everything you do. Without your guidance and preparation, we would not have been able to be successful. Each one of you has had a major impact on my game and my life. I have had the honor of being around some of the best hockey minds and they are all special people. You are all amazing and I would do anything for you, so thank you again. To all our managers and equipment staff, thank you for all the work behind the scenes. We all know that the job you do is not at all an easy one, and we aren’t the easiest bunch of guys to deal with, but every single day you came to work with a bright smile and a lot of passion. Thank you for brightening every day, and doing what you do to make everything easy for the players. You guys never get the credit and the thanks that you deserve, so I want to make sure you get it here. To our training staff and our strength coaches, thank you. Each and every weekend I was able to go out and play because of how you guys helped us train and helped us heal. With your guidance, we were all put in the best position to be successful. To Coach Quinn, thank you for believing in me. Thank you for getting me to move across the continent to play hockey for BU. It seems like yesterday I called you to tell you I was committing to BU. You’ve been an amazing coach and mentor for me in my four years and you always taught me that no matter what, there is always more to give. You’ve inspired me every single day and pushed me to give my best every time I’m on the ice. You’ve shaped my life in ways you do not know, and for that I’m extremely grateful. To my family and parents, thank you for your unwavering support. It is not easy to move to a different country, and without your love and support I would not have been able to do this. You helped me through the hard times of missing home and made me remember each day how blessed I was to be here. You are the best support system and made playing here a reality. Thank you for doing that. To the current seniors, my classmates, my brothers — we’ve been through a lot together in our four years. We have made a lifetime of memories and you guys will always have a special place in my heart. Without you guys I would not be the player and, most importantly, the man I am today. I want to thank every single one of you for having such a positive impact on my life. You guys have made the time here so special. You’re all amazing players and even more amazing people. You handled your time here with class and always came to the rink ready to make us better. You helped bring a winning culture back to BU and I am really confident with the future of BU hockey because of you all. Finally, I want to thank this year’s team. You guys made being a senior the best thing in the world. The amount of effort and passion you guys brought every single day made it fun coming to the rink. You guys pushed me to be a better leader and a better person every single day. Thank you for letting me be your captain. It’s been the biggest honor of my life to be able to wear the “C” for this school and represent not only an amazing school, but an even more amazing group of guys. So from the bottom of my heart, thank you. I love every single one of you and you are all going to do amazing things for this program in the future. It’s been an honor to represent the Scarlet and White. Go BU. What a beautiful letter, Brandon! Your parents should be proud of what an outstanding young man they raised. I have become a huge hockey fan because of BU hockey, starting with 3 years ago when my daughter started Freshman year and became a member of the Pep Band. (The Comm Ave classic is one of my favorite days of the year.) Wishing you all the best for happiness and success as you continue on your life’s path. Thanks for all your hard work and passion Hickey. Whenever BU number 4 skated out onto the ice you make it known. The fans will miss having you but we all wish you the best of luck in your future! We are very proud of you son! Sad your 4 years are coming to an end at BU! 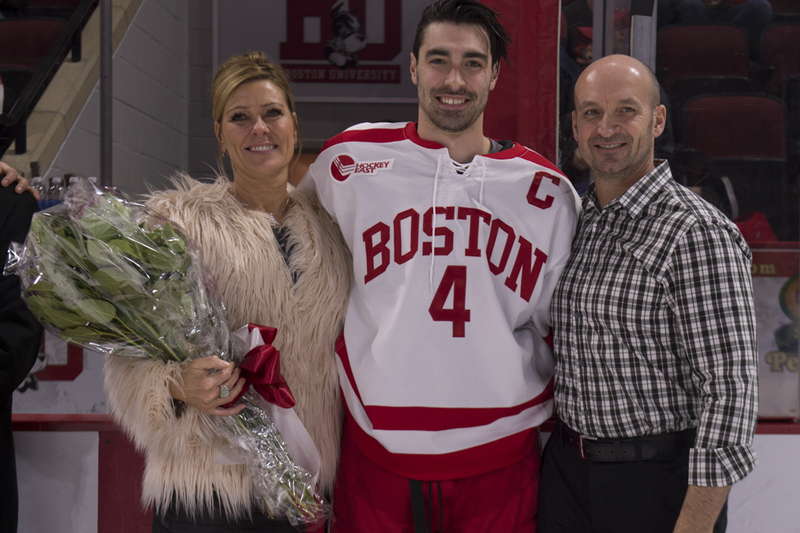 Thank you BU for everything you have done for our son Brandon! It was an AMAZING 4 years! We have met some incredible people on this journey. God Bless all of you! Thanks for representing BU and the best that it can bring out of a student, for each of your four years. Wishing you the best as you move on to the net chapter of your life.